I've decided to document my treatments of mild/moderate acne scars. I'm female, Africian American, and have suffered from acne since my teen years. I finally got my acne under control with major changes to my diet. Dairy and sugar were not my friends. Although I'd dealt with acne (and occasional cysts) for such a long time I managed to escape permanent scars in my 20's and most of my 30's. Then I found a spa that I went to for chemical peels and a few treatments of microdermabrasion for my chronic hyperpigmentation. I don't know if it was the spa treatments, the fact that I was stressed and smoking during that time, aging, or a combination of everything but I began to notice texture changes in my skin. Shallow pock marks and indentations on both cheeks. I was horrified and quit going to the spa. This prompted me to begin researching to treat these new skin problems. My scars are mild to moderate and about 4 or 5 yrs old. I'm not quite sure how to classify the scars but at an angle they appear to be shallow "dotted lines" Maybe mild rolling scars and a few icepicks/boxcars? I don't really know. Thank goodness that I've found this site. I've created a protocol based on research and advice that Sarah has given to others with similar scars. I have the vitamin c for serum, infoladan, 1mm dermastamp, 1.5mm dermastamp, and 1.5mm dermaroller. I plan to stamp and roll my scars once monthly. I am concentrating on my hyperpigmentation and deeper scars first then possibly make changes to my treatments depending on how my skin responds. I've given up smoking for good, working out more, improving my diet to incorporate green smoothies, lots of water, vitamins, and getting enough sleep. I feel pretty good about this journey and hope I can improve my face. I've suffered with skin problems long enough! Yes, we do have similar looking scars. I am still waiting for my stamp and roller. I can't wait to start! I am also happy to have found this site as a resource too. I was seriously considering an ablative type of laser treatment, but I was once told by a dermatologist that my type of skin has higher tendency to scar from laser type treatment. So, I haven't, and it's also expensive. You can imagine when I found this site. I got more excited as I read different posts from different people. Some of them have similar problems as mine and see improvement. Please keep me posted on your experience. I will update mine after 6-12 months, or maybe earlier if I can see visible differences. I had read so many negative reviews on laser treatments that I was afraid to try it. Plus as an African American I have a tendency to have alot of hyperpigmentation issues. I'm going to start my treatments this weekend and the 1st weekend of each month there after. I don't know if age has any impact on wound healing (I'm 40 too) so I plan to space my treatments one month or even 5 weeks apart. I'll be sure to document my progress regularly and hope that I can get some tips or words of encouragement from Sarah or anyone else that's interested in doing so. My skin problems has been a long and extremely emotional ordeal so joining this forum, posting my picture online, and being proactive with my treatment is a huge step! Please keep me posted as well FuturePerfect! Also, good luck to you and everyone else on their journey! Congratulations with quitting smoking and being strong enough to change your lifestyle! Apart from a few scars, your skin looks very good. It is hard to believe you are 40 years old and were a smoker. 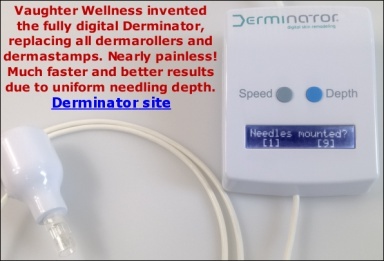 I think you bought more dermarolling tools than it is currently necessary but they are all suitable for your skin condition so when the 1 mm dermastmp gets blunt, use the 1.5 mm one. There is a good chance your scars will fill in. I do not see any rolling scars on your face (so do not buy the suction pump). On your first session, use just a dermastamp to see how your skin reacts. On your further sessions, stamp the scars and then roll the entire area (during the same session). It would be great if you could document your progress. We remind our customers that when you document good progress and post it here (if you want anonymously and we can help you with covering the eyes - just send us the pictures and we'll attach them to the posting), that we will reward you with products of your choice! I used the 1mm dermastamp late Friday evening. I was pretty aggressive and was really red for about 2days but my normal color is starting to come back. I know some of what I'm seeing is actually microswelling but my overall complexion looks pretty healthy! This is a pic of my right cheek that has the icepick/boxcar scarring. Its a little shiny from the Infoladan. I really like that stuff. I will post again in a few weeks just before I do my next treatment. Thank you and good luck with your treatment! Looking forward to your response and as always thank you so very much! I am happy your skin tone improved. If you protect your face from the sun as much as you can, the improvement will last. No, I do not think you should needle the scars a week or two after stamping. Wait at least three weeks. Stamp and roll and three weeks later needle and roll and so on. Tretinoin will likely improve your pigmentation. Use your copper peptides too but apply them separately from the Tretinoin and other creams. I've just read your posts about the super cop2x (that I've used only twice thank goodness) whew! and only on a few scars. Anyway, I'm still interested in using CPs on my icepicks but only real cps not that 2nd generation, skin damaging stuff in my bathroom. Thank you for keeping us informed. I had that kit for 6mos and never used it for some reason. Tossing it after today. I've researched your webshop to see if a copper peptide cream was available but unfortunately it is not. I remembered seeing the liquid mask before but was wondering since the mask has the new thicker consistency could it be scooped onto a toothpick and applied into an icepick scar? This was actually one of the reasons I was originally drawn to that "other stuff" from my previous post. I'm a little apprehensive to try the ret a only because of the drying effects but if applying it directly into an icepick scar and it helps to fill it in (even partially) actually works, then its worth a try. I will be doing my third needling session in about a week (first week of July) and I wanted to update some photos of my progress and share some adjustments that I've made in my treatment. I've used the 1mm stamp twice, once by itself and my last treatment I used with the 1.5 dermaroller. Using both the stamp/roller is obviously more aggressive and I think it made a difference with the final results. I will be using both stamp/roller for my subsequent sessions and I've also added both MSM supplements and MSM cream to my treatment plan for additional healing. It's been 3 weeks since my last treatment so my swelling is gone and here are my results. As soon as my scars fill in a bit more I may stop needling for a while to concentrate on lightening my skin. I just bought sunscreen with SPF 50 and hope that along with the MSM cream will help. I'm thinking I may update again in about 2 months or so and see what I'm looking like then. You have only stamped twice but I would say that there is definitely an improvement in the depth of some scars and in your skin texture. Try hydroquinone for your hyperpigmentation. Concerning your question (that I overlooked) about copper peptides, we do sell copper peptide serum and a copper peptide mask. Our A-Ret cream is worth trying on your cheeks. I think it will even out your skin tone. You can use the lowest percentage (0.025%). If the skin gets dry, apply almond oil or some other oil. Please keep us posted about your progress. At first I thought it was just wishful thinking but yes I am noticing some improvement after only a couple months. I think its because I am so aggressive with my needling and the supplements that I am taking is speeding things along for me The areas that I stamp are blood red after I'm done, it looks pretty bad. I apply the infoladan for about 3 days afterwards. I allow the scabs to fall off on their own and its pink smooth skin uder the scabs. Not all of my scars have responded this way though. I think this where the single needling and retin a or copper peptides will come in. My treatments aren't written in stone just yet. I'm still researching and tweeking as I go along but I'll definitely continue to post updates as I progress. I will be placing another order next week. Too bad you are sold out of the .05mm dermaroller clones I want to start rolling twice a week for product penetration and just noticed that they are permenently sold out. It's old stock. We are phasing those out permanently due to quality issues. That manufacturer is not able to supply us with the quality we want anymore.